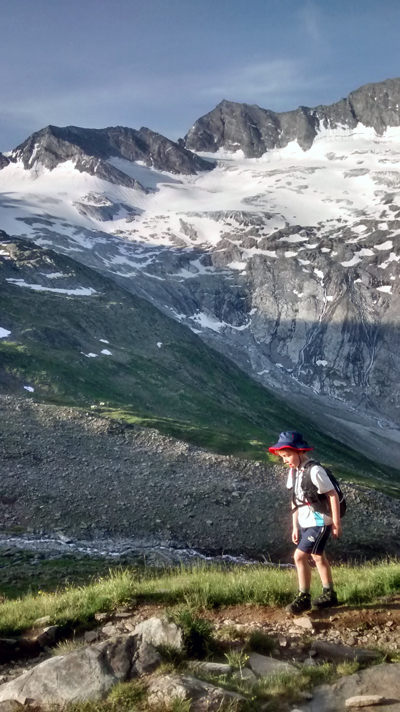 Bogong Blog - Zillertal Alps Hiking - with a 7 year old! In August this year my husband, Stephen, and I travelled to Europe with our seven year old son. We spent three weeks in Austria, basing ourselves in the picturesque town of Mayrhofen, in the Zillertal valley. Mayrhofen has two cable cars and provides an excellent base for walkers - from beginners who can walk along the Zillertal valley, to experienced walkers who can tackle the mountains. 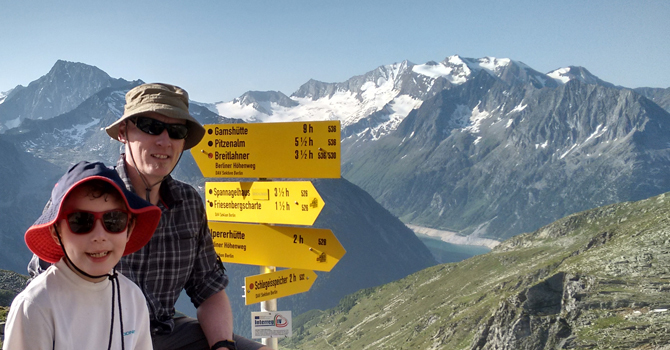 The highlight of the Austrian trip was the 'hütte to hütte' hiking in the Zillertal Alps. When planning our routes we had to take into consideration daily distances with which our son could cope – but he really surprised us with his energy and endurance. One thing to consider when hiking long distances with a child is to factor in time to take numerous short breaks. He needed this both physically and mentally, and it also forced us to stop and take in our surroundings. The hiking was amazing and the scenery was so gorgeous I often felt like I was in a movie. With the contrast of striking glacial mountains against vibrant green, flower filled fields, the Austrian landscape was even more beautiful than I anticipated!! The paths are extremely well marked, which is very reassuring when hiking with a child. Our son loved the interaction with wildlife – from patting dairy cows and goats, to seeing wild steinbocks and marmots – this was a definite highlight from him. The huts were fantastic – not having to carry your food, tent or sleeping gear was literally a load off our backs. The meals that were provided in the huts were homemade and delicious. Foodie tip: order the local speciality, Tiroler Gröstl. It’s a delicious bacon, onion and potato fry up topped with a fried egg (or three if you’re lucky). And for dessert order kaiserschmarren, which are delicious sweet chopped pancakes. We wrongly assumed that the half board would be a cheaper option – this includes the price of your bed and a three course meal. But honestly, the à la carte meals were much better value. It is extremely valuable to learn some basic German phrases and greetings as a matter of common courtesy. Some of the Hutte owners speak a little English though. Also, I would recommend having your phone handy to translate menus! We took two separate hiking trips to give Callum and ourselves a rest and spent a couple of nights back in Mayrhofen in between. We moved around quite a bit from guesthouse to guesthouse, often only spending one or two nights in each. This was not ideal for either us or Callum as it was either tiring searching in the scorching sun or, if it was getting late, very stressful. In the future I will ensure that we stay at a guesthouse for a minimum of three nights, and always book in advance – “playing it by ear” is fine when you’re a couple but not when you’re a family! Tip! – If you heading into the mountains check with the guesthouse that you are planning to stay in post-hike to see if they will let you store some of your clothing, footwear etc. that you will not need when hiking – there are no storage facilities in the towns or at the train stations. To find out more about hiking in Austria and staying in mountain huts check out these blogs. Hi Sam, I have just come across your Zillertal blog, lovely to read you enjoyed it, I am not sure if you were on the Berlin high wall trip but its a lovely place to hike, I use to live up on the glacier at Hintertux and hiked right through the Zillertal, you know you can hike from the tux Glacier to Innsbruck as long as you know the way, Austria is unknown to many in Australia especially this area, glad you liked Mayrhofen and the food.